Planning a wedding is always stressful. You are trying to organize a thousand moving pieces and you know that no matter what you do, a problem will always arise that you didn't even consider. For example, having to rescue a drowning child. Clayton and Brittany Cook were married this past Friday in Kitchener, Ontario. After the service they were posing for some photos on a bridge. 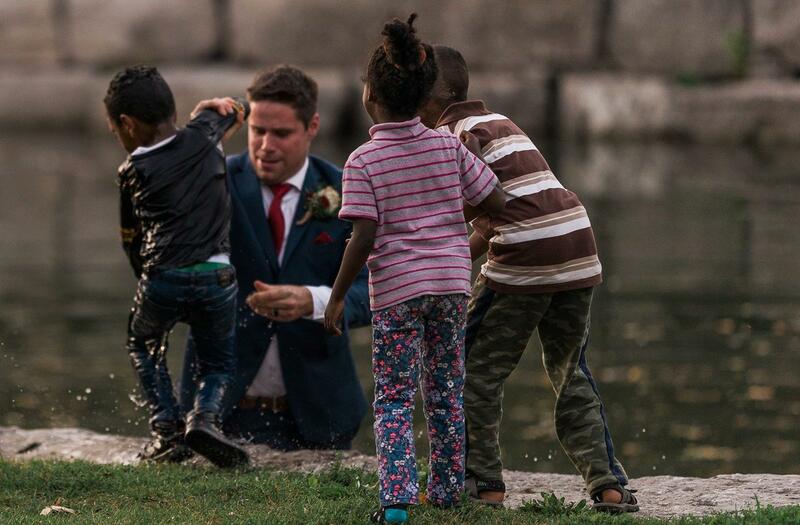 Clayton Cook noticed a child struggling in the water below and he leaped into action. Their photographer, Darren Hatt, explains exactly what happened on his Facebook page. In a statement to the Huffington Post, the bride further explains what happened. It was my turn to get my solo pictures taken so Clay was hanging out by the pond waiting. We had three kids following us around [and] Clay noticed there was only two kids he could see... he walked over to check on them and noticed the kids looking at the water and one kid was struggling to swim, so Clay jumped down on a rock ledge closer to the water and pulled him out. Everyone who has heard their story is thinking the same thing. Good thing they were there.